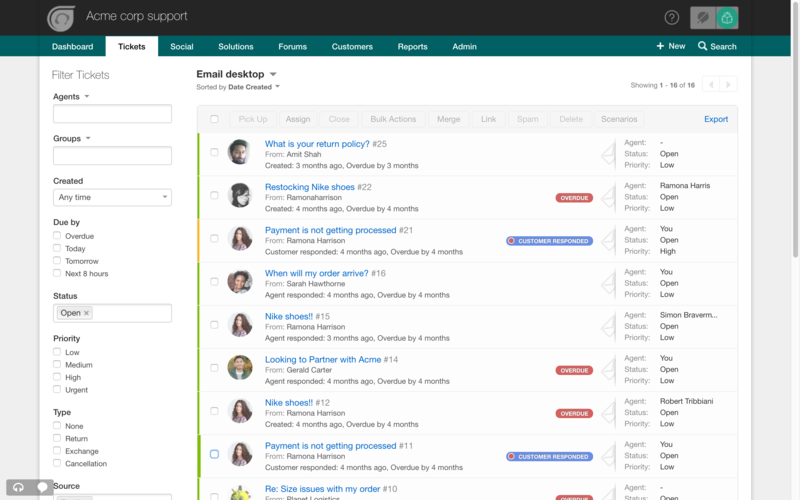 Freshdesk is great for support ticketing, FAQs, and items that can be easily reviewed, addressed and resolved. It's not ideal for lengthier conversations or long-term projects, as it could get difficult to track multiple conversations or use the SLA notification features since long-term projects will typically have different duration parameters. Though the ability to merge tickets & edit subject lines in Freshdesk is helpful (I wish Gmail would let me merge conversations! ).Additionally, I have another client who attempted to use Freshdesk as both a support portal and CRM solution, which didn't work well. It's ideal if all communication runs through Freshdesk, so it can be tracked and monitored. If leads are coming into Freshdesk, and then managed offline, there's a tendency to have a lot of open/unresolved 'tickets' because users don't want to bounce back and forth. However, I believe Freshworks offers a CRM solution, so that would likely be the best way to go for CRM needs (though I've not used it). TOPdesk is well suited if you are implementing your first ticketing tool and/or if your organization is less than 2000 users. Also, if your organization has no high ITIL skill level. The TOPdesk team helps a lot to compensate this. Freshdesk is easy to use and setup. Ticket management for tracking issues works very well. Multi-channel support includes live chat, email, and Phone, which is very useful. The product support team is responsive. The product is customizable and you can setup the customer portal based on your needs. The greatest win for our organization was moving to a managed hosted platform. This gave us improved access for our remote users and increased service availability. The modular nature of the TOPdesk products allows us to only use the features we need. Additionally, the license model gave us increased opportunity with who can use the products. Almost all aspects of the product are customizable which means we can expand the product to other departments for their service needs. We are a b2b provider, and we haven't found a good way of identifying the contacts with each of our customers. Tagging the contact seems to be a way, but you need to do couple of extra clics to go into the contact details and then introduce the client identification as a tag. I didn't find a good way to identify tickets with a status representing that it's overdue because of the client. The merging tool, although VERY useful, isn't for me completely intuitive. I have to pay a lot of attention at the icons and read the tooltip to make sure I'm keeping as main ticket the one that I want. For us the change module is to comprehensive, and we use it only in a light form. The only downside is flexibility in multi email traffic within a single ticket. Other than that everything else is easy to use to get the job done and keep the customer happy. We have never had an incident where Freskdesk was out of service. Any issues we have had was resolved in a timely fashion without the need for multiple contacts. I do not have to worry about the service having problems, because of the quality of support they provide their customers. The support is very good, from implementing to adopting. The consultant who helped us had a good view of our organisation and could translate it into a good working tool. Over the years we had good support, for example with the creation of standard forms for billing. Also the change of contract was very well and customer friendly. I haven't used other help desk software and I wasn't the one who selected Freshdesk. Our previous solution was just plain old email directed to all the ones involved in helping the users. It is a huge improvement from that way of working, because keeping track of who answers each ticket and when is key to success. I'm pretty sure that in the future we will get better use of metrics and more advanced features as our company grows. We haven't used any other TOPdesk products as I don't know what is available. Positive: Helps me and my team stay on top of our queue so we know when Contacts are engaging with us. Positive: Freshdesk is very simple to use and easy to get started on. Positive: Their API works well with the applications we use in between our app and theirs. The users are getting used to the TOPdesk environment pretty quickly! Starts at $0 for unlimited agents with the Sprout plan . Higher plans at $19, $35, $49 and $89. The 21-day free trial covers all features at the Estate plan.